1998 Stratos 283 DC, 1998 Stratos 283 DC equipped with Evinrude 150 Intruder outboard motor and Evinrude 24 V trolling motor. 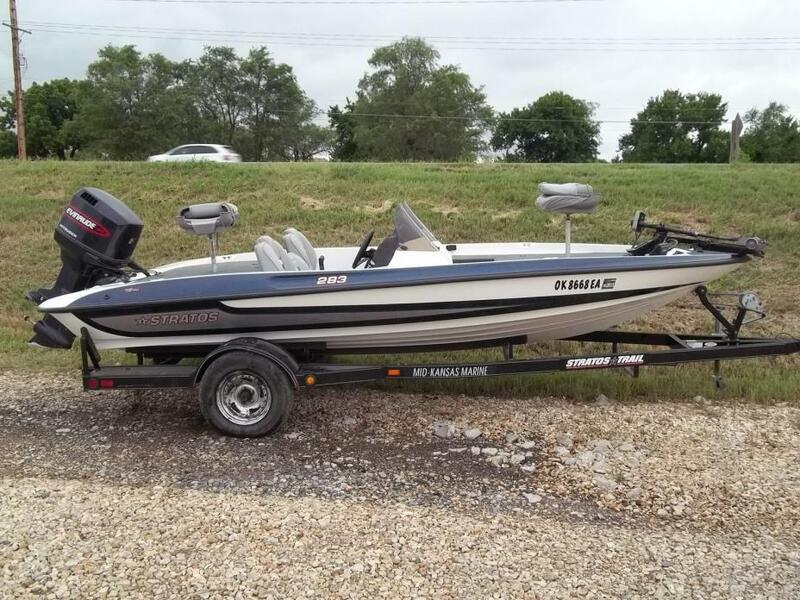 Boat includes strap cover, livewell, Lowrance depth finder, hot foot, water pressure gauge, pro trim system, 4 person capacity and single axle trailer. Please call before coming to view as our inventory changes location frequently. 1998 Stratos 283 DC The Stratos 283 DC is a dual-console version of the 283 VR. With its 91-inch beam this is the roomiest twin-console bass boat available in its size class, ideal for team tournament competitions. Team members can fish side-by-side on this 18-foot bass boat, from the large front deck, which runs all the way to the consoles. Twin rod lockers and roomy dry storage boxes enable the 283 DC to corral a lot of gear. The 283 DC has a smooth ride and excellent top-end with 150 - 175 horsepower outboards. 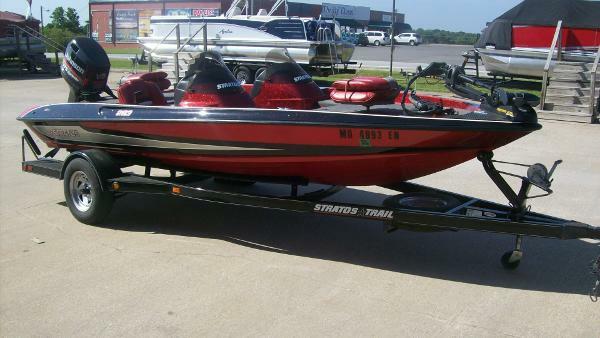 Stratos dual-console fishing boats are built at the company's Old Hickory, Tennessee manufacturing center. Every Stratos DC model comes standard with windshields on both consoles, locking passenger glove box, elevated casting decks (a rear deck insert is available on the 219DC), full instrumentation on the driver's console (Pro Elite models have oversized Faria racing-style gauges), pro-style pedestal fishing seats, driver and passenger bucket seats, rod storage (two boxes on Pro Elite series and 283DC), abundant dry storage, professional-tournament livewells, and more. An optional bench seat is available on many models. Performance and riding comfort are built into every Stratos DC with instant plane off, quick acceleration and top-end speed. Plus, the Stratos Radial-Vee hull softens the blow in rough water to deliver a smooth, dry ride.